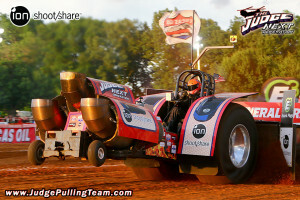 50 years of Tractor Pulling passed down from one man to six sons. 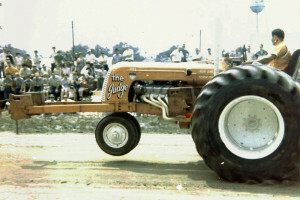 RON’S FIRST TRIP DOWN A DIRT TRACK WAS IN 1959 RIDING ON AN ALLIS CHALMERS WD AT THE ANSONIA FFA SPONSORED TRACTOR PULL. AFTER THAT, HE WAS HOOKED. LATER HE STEPPED UP TO AN ALLIS CHALMERS XT 190 AND THEN IN 1967, RON AND A FRIEND PUT A 265 V-8 CHEVY IN A 101 MASSEY HARRIS TRACTOR. 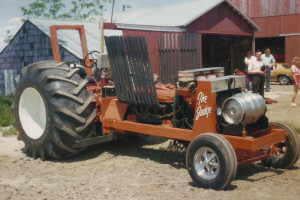 THIS WAS RON’S FIRST MODIFIED TRACTOR. POWERED TRACTOR WAS BUILT. HE WENT FROM A SINGLE ENGINE TO A TWIN ALLISON TRACTOR TO KEEP UP WITH MULTI-ENGINE POWERED TRACTORS. 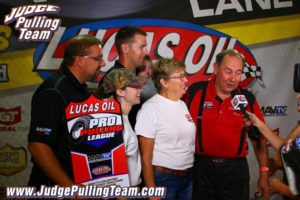 HE KEPT UP WITH THEM TO SAY THE LEAST AS HE WON MANY PULLS AND CHAMPIONSHIPS DURING THIS TIME. IT WAS A FRIEND THAT GOT HIM BACK INVOLVED IN PULLING. 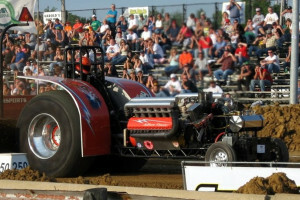 MIKE HOLDEN HAD TWO MODIFIED PULLING TRACTORS AND ASKED RO N IF HE WOULD LIKE TO HELP HIM RUN THE NATIONAL CIRCUIT. 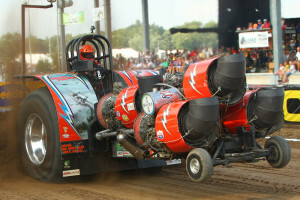 AFTER A COUPLE OF SEASONS OF GRAND NATIONAL PULLING, RON AND MIKE DECIDED, BECAUSE OF RULE CHANGES, TO RUN THE STATE CIRCUIT. 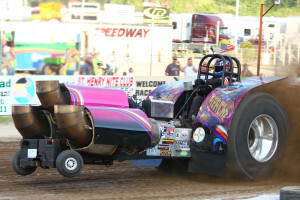 THE JUDGE #6 WAS BUILT IN 1992 WITH TWIN ALLISON MOTORS AND ENGLER CHASSIS. WITH ONE OF HOLDEN’S TRACTORS, SILVER, WE WENT STATE PULLING. 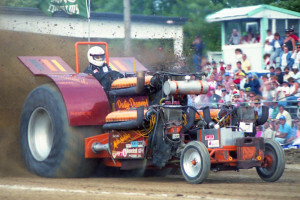 SILVER STOPPED PULLING AFTER THE 1994 SEASON WHEN IT PUT EVERYTHING ON THE TRACK DURING A RUN THAT SUMMER AT ALLEN COUNTY FAIR. RANDY, THE OLDEST SON, STARTED DRIVING IN 1993 AND SEMI-RETIRED IN 1995. THE NEXT SON TO START DRIVING WAS DARRICK, DURING THE 1999 SEASON AND RECEIVED THE ROOKIE OF YEAR AWARD. IN 2000, ANOTHER SON JUMPED IN SEAT; RON II. IN THE FALL OF 2000, THE JUDGE WAS SOLD. 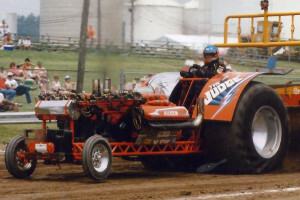 THAT WINTER OF 2000-2001 WAS SPENT BUILDING THE JUDGE#7. THIS TRACTOR HAS A BANTER CHASSIS, BANTER GEARBOX, AND 5 T-53 LYCOMING TURBINES. NOW RANDY AND BRAD HAVE JUMPED INTO THE DRIVER’S SEAT. 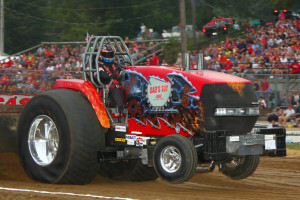 IN AUGUST OF 2006, WE BOUGHT THE TWIN ALLISON TRACTOR BACK AND NAMED IT THE JURY. WE RAN IT FOR 2 SEASONS, 2007 AND 2008. THEN SOLD IT DURING FALL OF 2008 AND STARTED BUILDING ANOTHER TRACTOR. 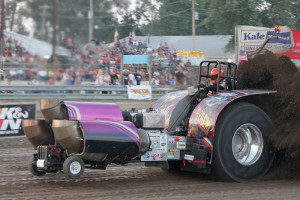 IT IS JUST ONE MORE ADDED TO DAD’S LONG LIST OF TRACTORS HE HAS BUILT DURING HIS LONG AND SUCCESSFUL TRACTOR PULLING CAREER. ‘APACHE’ HAS A BARGA BUILT TUBE CHASSIS, SCS GEARBOX, AND 3 TURBINE ENGINES ON BOARD. TWO T-55’s, AND ONE T-53. 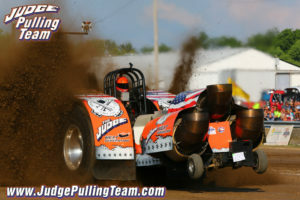 DURING THE 2009-10 WINTER, WE BUILT ANOTHER CHASSIS FOR THE JUDGE SINCE THE CHASSIS IT HAD WAS GETTING OLD. WE ALSO ADDED A TRANSMISSION BUT THAT ONLY LASTED FOR THE 2010 SEASON AS WE HAVE TAKEN IT OUT. THE JUDGE DIDN’T RUN LIKE IT IS CAPABLE OF AND WE THINK IT WAS LOSING TOO MUCH HORSEPOWER TURNING THE TRANSMISSION. ALSO DURING THE WINTER OF 2010-11, A DIFFERENT CHASSIS HAS BEEN PUT UNDER ‘APACHE’. DURING THE WINTER OF 2012-13, THE ENGINES THAT THE JUDGE USED HAVE BEEN SOLD. WE WILL RUN ONLY ONE TRACTOR THE SUMMER OF 2013. FOR THE 2014 SEASON, THE JUDGE IS BACK !!! ONE SEASON WITHOUT THE NAME THAT STARTED IT ALL WAS LONG ENOUGH. NEW DESIGN, NEW SPONSOR, AND NEW NAME! THE JUDGE ‘NEXT GENERATION’ HIT THE PPL CHAMPIONS TOUR. ALSO IN 2014, DAD (RON) JUMPED INTO THE ALCOHOL SUPER STOCK DIVISION WITH DAD’S TOY (ONE OF LARRY ROBERTS TRACTORS).